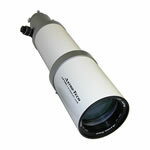 Designed to handle the rigors of public star parties and educational outreach, the Explore Scientific AR Series has standard hardware which includes a precision 10:1 two-speed focuser, a 2-inch diagonal, an 8x50 finder scope, and a case. You can be confident that the quality and construction of these telescopes will allow heavy use for many years and are backed with a transferrable Five Year USA Limited Warranty. The optics in their collimatable lens cell are fully multi-coated to eliminate light scatter and maintain image contrast. 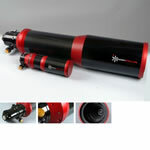 We precision collimate every Explore Scientific telescope at our factory to give optimum performance. 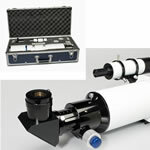 Although you may never need to adjust optical alignment, the AR Series allows for collimating the lens set should the telescope ever require it. 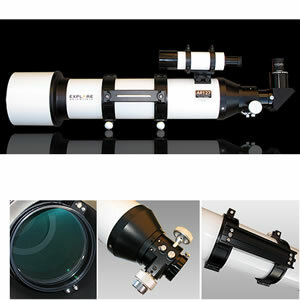 Deluxe 10:1 Two-Speed Focuser - The Explore Scientific Air-Spaced Doublet AR Series telescopes include a precision 2-inch ten-to-one, two-speed as standard equipment. The eyepiece holder uses a compression ring to prevent the eyepiece or camera barrel from scoring. On those prestine nights of steady seeing, Saturn's Rings can forever affect the hearts and minds of almost anyone who lays eyes on them. It's nights like these that astronomers like to set up their refractors and push the magnification to the limits, not only to see the magnificence of the planet at greater scale but to really test the optical and mechanical quality of the telescope. 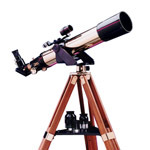 Many telescopes are only supplied with a standard single-speed focuser, you will find that a tiny nudge will throw out focus and turn your night into one of frustration. 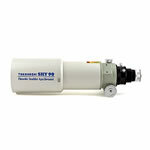 So we included as standard equipment, on all Explore Scientific AR Series, a ten-to-one, two-speed Crayford-style precision focuser with tension adjustment and lock to obtain and hold perfect focus. We think you'll agree that such precision is worth it. 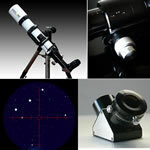 Universal Mounting Plate - The Universal Adjustable Mounting Plate of the AR 127 fits on many popular equatorial and Altaz mounts, including mounts supplied by Explore Scientific, Vixen, and Meade LXD55/75. Instead of using a cast metal part, Explore Scientific's Universal Mounting Plate is made from extruded aluminum for added strength, it is afterall what secures your telescope to the mount. We also include adjustment screws and locking bolts to allow adjustments to position the angle of the telescope when it is placed on its mount, an important feature when using an equatorial mount. 2" Diagonal Mirror - The Two Inch Mirror Diagonal includes a 1.25" eyepiece holder adapter. 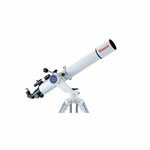 The purpose of a diagonal is to securely hold your eyepiece and to give you a comfortable viewing angle. Provided as standard equipment, Explore Scientific's Two Inch Diagonal incorporates a light-weight, one-piece diagonal body that securely cradles the precision polished diagonal flat mirror, insuring precision alignment. 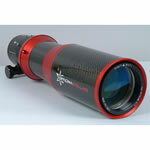 8x50 Finder Scope - The Explore Scientific 8x50 Finder Scope provides a true field of view of 6 degree. 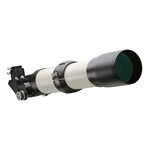 Its coated optics provide a bright high-resolution image so that many faint stars and nebulosity can be detected for precise aiming. The front objective can be custom focused to provide a sharp image every time. 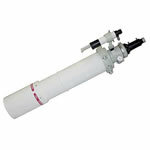 Optical Tube Assembly Weight (with all standard accessories): 15 lbs - 6.8 kgs. Shipping Carton Dimensions: 16" x 13" x 35"
Case Dimensions: 35" x 13" x 10"